Gratitude helps me be more productive, you say? That sounds too simple, too outrageous, and not strategic enough. It may be all of those things, but it is also true. 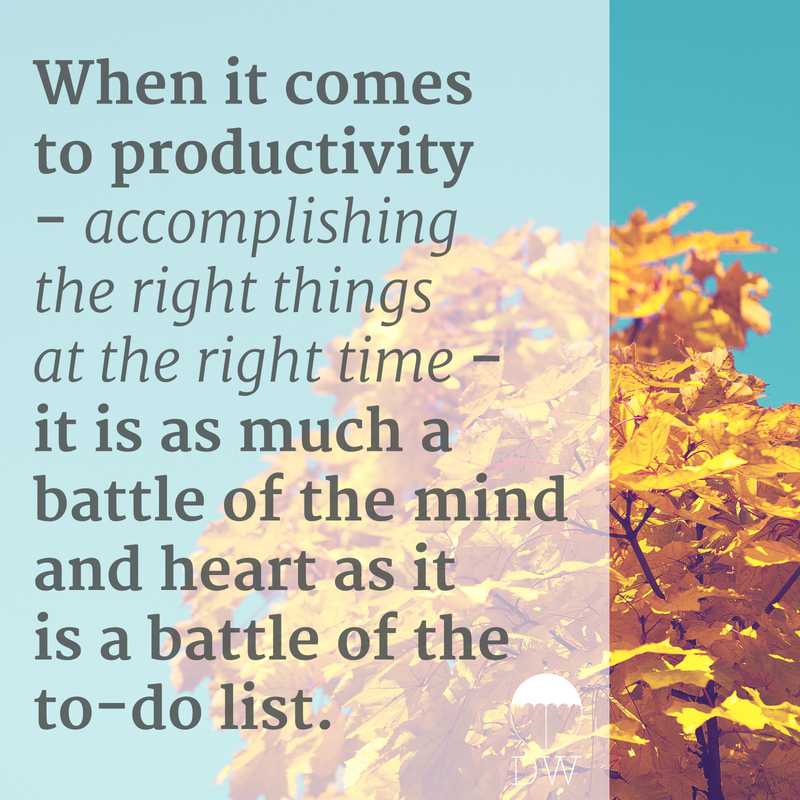 When it comes to productivity – accomplishing the right things at the right time – it is as much a battle of the mind and heart as it is a battle of the to-do list. Establishing a regular gratitude practice can go along way in shifting your mind and heart to a place more conducive for productivity. How you ask? One of the key reasons we fail to get started on accomplishing what’s on our to-do list is fear. Fear holds us back in ways we are not even aware of. It’s continuously whispering to our subconscious and stifling our motivating. Establishing a regular gratitude practice cultivates a voice, one of confidence and courage, that becomes louder than that voice of fear. When we take a few minutes to pause and consider what we are grateful for, we are reminded of the truth about ourselves and our situation, a truth that fear wants us to forget. We are reminded that we have been given a unique skill set and gifting to add value to the world around us. And when that voice becomes louder than the voice of fear, we waste no time in getting started. One of the major downfalls of to-do lists is they cause us to focus only on the tasks and challenges that still lie ahead of us while causing us to forget everything we have already accomplished. This leaves a project feeling incredibly daunting which oftentimes paralyzes our productivity because we’re left wondering where in the world to even begin. Establishing a regular practice of gratitude encourages us to focus on what we have already accomplished. It reminds us of the mentors and teammates and hard work that has helped us to this point. When we stop to remember the challenges we’ve overcome we remove one more major roadblock to getting started. We live in a world that seems to only move faster and faster with each passing day, month, and year. Our to-do lists get longer, the work gets hard, and impact feels smaller. When there is so much to do and to be every day it’s easy to feel overwhelmed, to feel like your life is pure chaos. When we reach that point we can’t think clearly enough to even make a to-do list let alone accomplish it. Establishing a regular practice of gratitude cultivates peace that calms the chaos. Such reflection reminds of what is important, reminds us what we value, and reminds us what we are working for. When we mentally can find a place of inner calm amidst the outer chaos, getting started on our to-do list no longer feels daunting. When was the last time you took a few minutes to reflect on what you are grateful for?